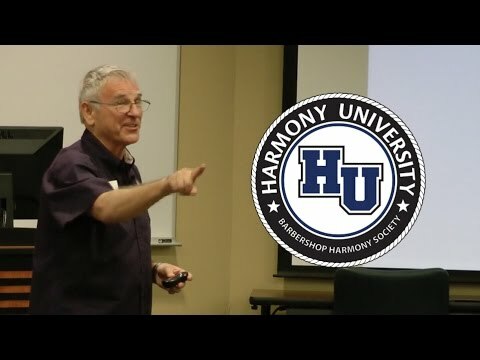 Intro to Barbershop: What is Barbershop? What is barbershop music, how is it arranged and sung? You’ve joined the Barbershop Harmony Society. You might have instead joined a church choir, a symphonic chorus, or formed a small combo sing Central European folk songs… but here you are in a barbershop group! What have you gotten yourself into? 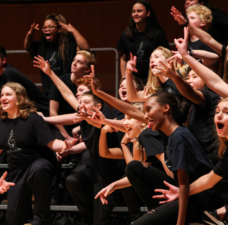 What kind of music will you be experiencing, how do you distinguish it from other vocal music, and where did it come from? And why does it matter? With the melody carried in the second-highest voice part (barbershop “lead”), a high tenor harmonizing above that, a bass singer singing fundamental harmonies (mainly roots and fifths), and a baritone filling in above and below the melody. Building on that working definition, there are specific benchmarks around the “barbershop seventh” chord and other common chord progressions, but that’s the essence. Within that definition lies a wide range of music under the “barbershop umbrella”: contest music, show music, “barberpop,” gospel, religious, and patriotic music. Continuing academic research confirms that the musical tradition that we call “barbershop” takes its roots in the African-American improvisational traditions of the late 19th century, notably in the South, particularly New Orleans. Yes, barbershops were a gathering place, and certainly close-harmony experimentation took place there. But the instrumental improvisations of early jazz and blues musicians led to vocal harmonic improvisation and vice versa; typical embellishments as “swipes,” back times, and pickups became ingrained in both forms. The stereotypical incarnation of Middle American white males in red stripes and straw hats was never a reality, but rather a later nostalgic show business misconception. 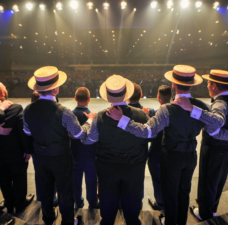 The barbershop style has grown and changed through the decades, from simple songs harmonized strictly by ear (“woodshedding”) , to encompass a wider range of material, arranged with care by skillful musicians, and performed with sophisticated staging, choreography, and theatrical flair. Yet there will always be room -- and heartfelt desire -- for the simplicity of four voices and a melody. 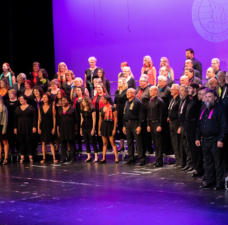 Most people are accustomed to seeing vocal music presented as Soprano, Alto, Tenor, Bass (SATB), whether in a hymnal, chorus arrangement for theater and so forth. 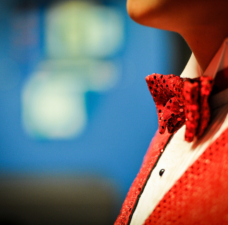 Arrangements for male-only choruses might also be styled as Tenor I, Tenor II, Baritone, Bass (TTBB.) In ether case, the melody is usually found in the uppermost part. In barbershop, the melody is usually sung in the second-highest voice part, which we call the “lead.” A high tenor (often a falsetto voice) sings simple harmonies above that melody. The lowest voice, the bass, sings the simpler low harmonies, and a baritone fills in the tricky stuff above and below the melody. As you spend time singing barbershop and meeting Barbershoppers, you will encounter a wide range of opinion over what constitutes “real” barbershop. Certainly all the hallmarks of the style discussed here can be applied to many songs. 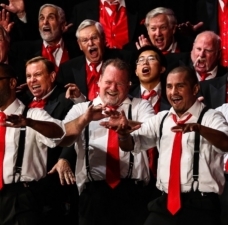 Historians studying the earliest uses of the term “barbershop” as applied to vocal music are increasingly of the opinion that it means many things. Written accounts from the 1890s apply it to church music, music sung with orchestras, instrumental music, gospel music, music sung by men and women. By 1910, and the publication of “Mr. Jefferson Lord, Play That Barbershop Chord,” general audiences would be familiar with the term. As the vocal harmony style founded by African-American musicians began appearing in recordings of white performers, the style became increasingly associated with those recording artists. By the time of the “barbershop revival”and the founding of the Society 1938 , a musical split had occurred, with “traditional barbershop” frozen in time by white performers, while jazz and gospel continued to evolve and flourish among African-American musicians. Today, a freer musical format and emphasis on suitability of song to performer and audience has created an atmosphere of greater experimentation variety, and nimbleness to adapting new hits to the style. 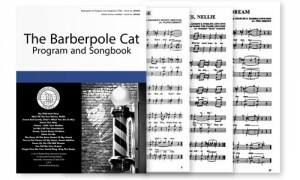 That core experience of ringing big barbershop chord is most easily accomplished by singing the Barberpole Cat songs, twelve songs you can count on hearing anywhere sung by Barbershoppers around the globe. Sing through “Let Me Call You Sweetheart” or “Sweet Roses Of Morn,” and you will have sung the barbershopping-est chords in the style, and produced some serious overtones. EXTRA CREDIT: Watch our video series on the origins and history of Barbershop!